Gold Tone Close To My Heart is an on-trend update of one of our favorite women’s medical ID pendants. The asymmetrical heart with textural detailing is a gorgeous, go-to style for daily wear. This water-resistant stainless steel medical alert features a yellow gold tone finish and a white medical caduceus symbol on the front ito alert first responders to your medical information, engraved on the back. Adjustable from 20-23”, the gold tone necklace features a stylish accent bar and lobster clasp closure. 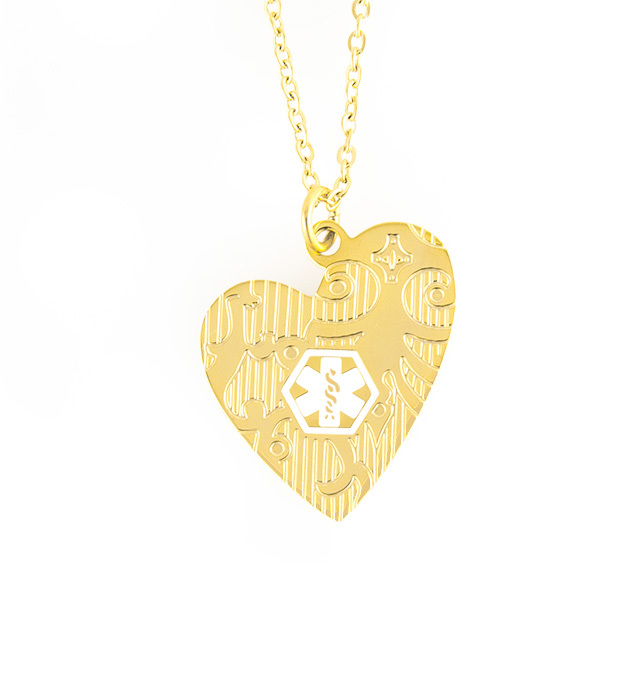 Comfortable and discreet, Gold Tone Close To My Heart is a custom-engravable medical alert necklace that’s ideal for any condition or even as an ICE (in case of emergency) ID. Simply list your information, and we will engrave your medical ID so it’s just right for you. Learn more about what to engrave on your medical ID here, or contact us for personal assistance. Medical ID necklaces are an excellent option, as 95% of first responders polled confirm that they check neck and both wrists for the internationally recognized medical caduceus symbol. Medical ID necklaces and pendants are also particularly beneficial for those who experience swelling of the extremities, as with lymphedema, as this can cause one’s wrist size to vary significantly, and that means necklaces are sometimes a more comfortable, assured fit.